Artech Lake Gardens is not just another address to own. It’s a retreat set in the lap of nature to offer you luxurious living like never before. Situated alongside the Akkulam Lake and surrounded by scenic beauty. Artech Lake Gardens is the latest premium project offering from Artech, the eco-friendly home experts well known for their aesthetic designs. scientifically engineered structures and clever space planning. 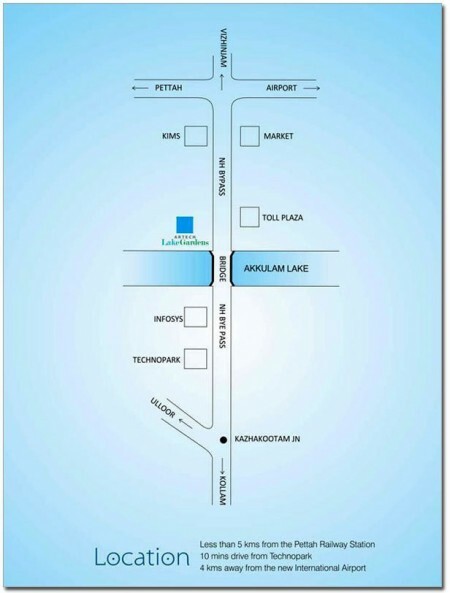 Spread across 2.3 acres and centrally located at Akkulam, NH Bypass, Thiruvananthapuram, Artech Lake Gardens is a joint venture with the Muthoot Pappachan Group. Located just 5 kms from Technopark, this new venture also has the advantage of being amidst an emerging IT zone. Deep Pile / Raft foundation complying with seismic 3 zone. RCC frame structure with brickwork and or Concrete block partitions. (All Plumbing services passing through the walls are solid black, Concrete grade and Steel grade) as per structural consultant’s advice. Lift Lobbys and Fascia Wall & floor Composite Marble / Granite / Vitrified Tiles. As per Architect design. Staircases: Granite / Vitrified flooring with hand Railing as per Architect design. Car park Area : Grano Flooring with Grooves or exterior grade paving tiles. Living / Dining / Kitchen / Bedrooms : 60cm X 60cm Vitrified Tiles. Toilets : Designer ceramic tile concepts for floor and walls upto 8′ 0″ height. Utility Room : Ceramic Tile for Wall and Upto 4′ 6″ in wash counter area and 2′ above the counter if any. Balconies : Rustic / antiskid / ceramic tiles 30cm X 30cm with MS / SS / Glass railings. Open Terraces / Decks : Rustic / antiskid / ceramic tiles 30cm X 30cm. Sanitary fittings: EWC wall-hung, concealed cisterns, counter washbasin. All sanitary fittings shall be of American Standard or equivalent. Faucets: All Faucets shall be single lever concealed diverters CP finish, heavy body metal fittings of Jaquar or equivalent make. Hot water connection shall be provided for all toilets. Plumbing: All water supply lines shall be in medium class CPVC pipes. Drainage lines and storm water drain pipes shall be in PVC. Kitchen & Service Area : Wall mounted Faucets / taps would be provided. Stainless Steel Sink multi bowl with drain board shall be provided for the kitchen and stainless steel sink without drain board will be provided for the utility and service areas. Towel Rods, Soap Dish and Health Faucets shall be provided inside the toilets. Window Shutters: Prefabricated Colour Anodised Aluminum Sliding windows. Door Frames: Main door frame and shutter shall be of seasoned Teak wood. Outer face to be PU coated and Inner face melamine finished. Door Shutters: All internal door frames shall be of hard wood with flush door shutters. All internal and external faces shall be melamine / enamel finish. Hardware: All hardware shall be in C.P Brass, tower bolts, doorstoppers, ball bearing hinges. Locks shall be mortise of Dorset /Yale make or equivalent. Concealed Copper wiring of Finolex or equivalent make with modular plate switches, centralized cabling system for all electrical and communication requirements. Wiring shall be done for lighting, 5Amps, 15 Amps and AC points in the Apartment. Switches: All switches shall be Crabtree / Legrand / Schneider or equivalent make. Generator: Power backup will be provided for all common services and selected light and fan point in each living, bedrooms inside apartment and a refrigerator point except Air-conditioning and Geyser points. Light fixtures for the Common areas, External areas, apartment Balconies and Entrance door of the individual apartments would be provided. Adequate ELCB and MCB shall be provided in each apartments. Provision for the GEYSER points in each Toilets which is attached to the Bed rooms. Provision for Telephone and Internet shall be provided in the living room and Master Bed room. Provision for Split AC shall be given in Master Bed Room.